I've been meaning to make a blueberry tart for a couple weeks now. I've bought several boxes of them, but for some reason they had never made it to the dessert table until last night. This recipe is inspired by the classic french fruit tarts I was taught how to make at culinary school. The filling is a simple vanilla pastry cream (which is incredibly easy to make) and a light apricot glaze comes last, to give the finishing touch to the tart. I decided to make mini tartelettes this time which worked well for the party we were having that night. They're something fun and elegant about small finger food for dessert isn't there? If you've never made homemade dough, I highly recommend this recipe. It's a fairly simple fail-safe recipe that can be applied to countless desserts. You can also omit the sugar in the dough and make a savory tart instead. Sift the flour, sugar and salt directly onto a work surface (a cold surface such as marble works best). Cut the butter into small pieces. The butter must be very cold before you add it into the flour. Mix the butter into the flour by using a metal pastry scraper to cut in the butter and fully incorporate it into the flour mixture. You can also use your fingers, but if you do you must do it quickly to ensure that the butter stays as cold as possible. Once the dough has the texture of fine sand, create a well in the center by using a cup or a glass. Add the egg and water to the center (you can do this in batches depending on the size of your well). Gently beat the egg in the center and slowly incorporate the flour into the center making sure that the well does not break. Once most of the flour has been incorporated you can start using your hands. Knead the dough and form a round ball of dough. At this point, take a small handful of the dough, and, using the palm of your hand, smear it out completely onto the counter surface. This process makes sure that the butter is fully incorporated into the dough, and helps form a dough that will be easy to work with. Re-form the smeared piece of dough, and repeat with the rest of the dough until you have a pile of chunks of dough. Form it into a ball again. Wrap the dough in plastic wrap and leave to rest in the fridge for at least 45 minutes. Preheat your oven to 375 F. Take the dough out of the fridge, unwrap and leave it out for a few minutes so it warms up a little. Lightly flour your working surface and roll out the dough to about 1/8 inch thick round. Use small cookie cutters to cut out circles of dough. Place in buttered individual molds and gently prick the bottom of the dough with a fork a couple times. Then, place a small circle of parchment (a little bigger than the size of the mold) in the center of the circle of dough and place some baking beans on top to weigh the paper down. Bake for 10-12 minutes or until the edges of the tart turn a light shade of golden brown. Let the tartelettes cool for a couple minutes, discard the beans and parchment paper and leave to cool on a cooling rack. Separate the eggs and combine the yolks with the sugar. Whisk until the mixture turn a yellow pale of yellow (about 3 minutes). In a separate bowl, stir the cornstarch and flour together and add it to the sugar-yolk mixture. Stir to remove any lumps. In the meantime, bring the milk and vanilla bean to a boil. Stir occasionally. As soon as the milk starts boiling, add a ladle of hot milk to the egg mixture and stir vigorously (this ensures that the eggs won't curdle). Add all the egg mixture into the milk mixture and whisk until the mixture thickens. This take 1-3 minutes. Remove from the heat as soon as the mixture thickens. Place the pastry cream in a bowl and cover with plastic wrap. Make sure that the plastic wrap touches the surface of the cream (this prevents the formation of a skin). Let the pastry cream cool. Once the tartelettes and pastry cream have cooled down, add some pastry cream to the bottom of each tart. The cream should go up 2/3 of the tart shells. Add the blueberries on top. In a small saucepan, heat the apricot jam for about 3 minutes. Add the water and stir. The glaze shouldn't be too thick, so add more water if it seems to thick to brushed on top of the fruit. Once the consistency of the glaze seems good, gently brush the glaze onto the blueberries and serve. Enjoy! SOOO envious of your fresh blueberry supply!! Those mini tarts look heavenly. How very beautiful. Blueberries are a favorite in our home. These sound delicious. I just love baking with fresh blueberries. Never made these little precious gems though. But the cream with the vanilla bean sounds heavenly. These are so pretty - just the perfect little bite! Wow, this is exactly what I have been looking for.I have a friend that is crazy about fruit tarts but we haven't made them because we didn't really know how to make good ones (and Premier Moisson is down the street so we get lazy and go there). Thanks, I will save the recipe! These are so cute! And they look delicious. I haven't had fresh blueberries in some time...you're making me want them! 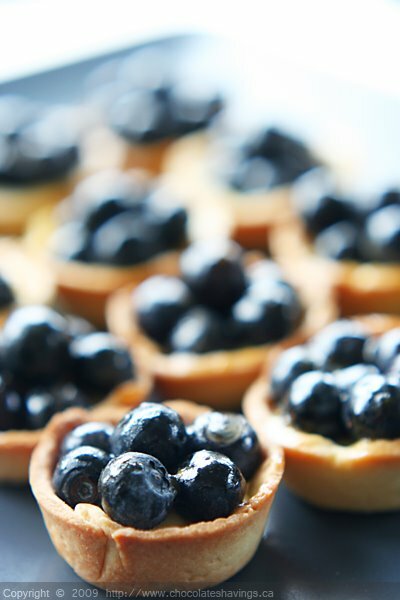 No fresh blueberries here, but i *HEART* those tartlettes...they are gorgeous!! Can I skip the egg in the tart shell? I'm a bit egg phobic.. Simply perfect! They make me want summer sooo badly! I agree, I also love that sophisticated look of finger food, and your tartelettes are just stunning! These are adorable! Great use for fresh blueberries! We made some blueberry muffins the other day. They were fabulous. Stunning!!! I love the pastry cream combo with vanilla bean! Oo..yum! Pastry cream makes everything so much better! It's the food I'd like to be on a desert island with! Your tartelettes look scrumptious! Blueberries are just beginning to come our way, and I must try these--they sound delicious and look adorable in this mini's version. Hey there, I just came across this book/magazine called "Quartiers Gourmands". It's a list of all the culinary artisans around Montreal. I guess they come out with it every year but I just picked it up and found a million amazing specialty places in this city that I never knew about. Thought you might be interested. I found that butcher that you were talking about in the book, Chez Vito sounds great! These mini tarts are just precious. I love the combination of blueberries and pastry cream...and of course, pastry crust makes everything better! And that little hint of apricot sounds delightful! Can't wait to try this out. I wanna eat it so badly.. Guess I'll have to make it this weekend, otherwise I can't stop thinking about it! So beautiful, simple and delicious. I love blueberries! Fantastic job. So, i can dig this - looks good. And those blueberries look fantastic. These look wonderful, I love blueberries. You make me want to reach for one and stuff my mouth. So beautiful! Those mini tarts look gorgeous! They remind me of a blueberry tart with cream cheese pastry cream that I've been meaning to make! This could not have come at a better time.I will be catering a small bridal brunch and little fruit tarts have been requested! Oh, these look amazing! Great photography, too! OOOOOOOhhh,.....AAAAAAAHHHHH/ these look perfect for my belly,....MMMMMMMMM!!!!! i am going to have to make these for the 4th! yum. your tartlettes look perfect! I totally just made a wild blackberry version of these, with a Cabernet Sauvignon glaze! Amazing! Thank you for the pastry cream and crust recipe!